It has been almost eight years since I first read The Shack. Within a year of its release, The Shack had sold over one million copies. I purchased one of those copies myself and read it within a few days. I was aware of the controversy that swirled around it. I was aware of the doctrinal issues concerning the Trinity and universalism among other things. Yet, I wanted to practice discernment for myself. I wanted to give an informed opinion about the book and help others think through its message. Such a response is needed once again as The Shack movie releases this weekend. When I had finished The Shack, my doctrinal concerns were affirmed. The blind acceptance of the book and its teaching was even more concerning after reading it for myself. But there was something else too. While many critiqued the literary quality of the book, I found the story moving. I identified with the main character, Mack, and his journey through great sadness. I resonated with his desire to hear from God in the midst of his suffering and believed that God could and does speak into these areas of our life. In fact, I think this is one element that is particularly appealing to so many. In the eight years since I first read The Shack, Mack's experience resonates in an even greater way through losing my own mother and father. Like Mack, and every other person who has experienced pain and loss, we all desire to know there is a God who draws near and speaks into our suffering. The rejection of the Bible's trustworthiness and authority is perhaps one of the most dangerous errors in The Shack because it is the very place from which we build our understanding of the nature of God, sin, and salvation. While there are some who abuse it and misinterpret it, we cannot discard it. We must return to it again and again to address the struggles we face. The Shack moves people in the opposite direction, away from Scripture and its authority. 'You're talking about the church as this woman you're in love with; I'm pretty sure I haven't met her.' He turned away slightly. 'She's not the place I go on Sundays," Mack said more to himself, unsure if that was safe to say out loud. While there is an important word here to those who have been hurt by people within the church, it also suggests that there is something to which you can belong beyond the local church through which we can experience life as God designed us to experience it. It rightly emphasizes relationships while simultaneously undermining the very place those relationships are enjoyed. The sharing of life together the Bible envisions is life together in the local church. The fullest answers to the real questions Young raises in The Shack are found in the very places he undermines: God's Word and His church. 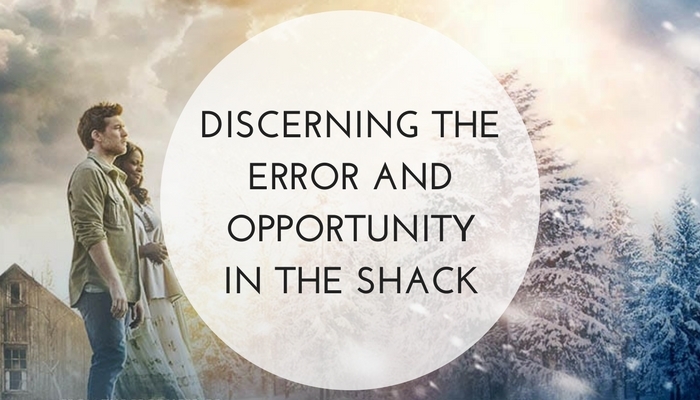 As The Shack comes comes to the big screen, I hope we will not only discern its error but that we will also discern the opportunity it provides us to share about our God who draws near to us in our suffering and speaks to us through His Son and the Scriptures.